Thread: Stay-Cation 2015 Has Begun! ... because I landed on my chin when I fell on Saturday. So no hiking, and my computer time is limited due to eyesight and arm issues. Donna, my goodness I hope everything heals quickly. Thanks for this very entertaining report. This morning I headed (alone) up to Los Angeles for a day that I've decided to call "Fan-Dom Day". Over my years on these forums, I occasionally note that folks decide to see something because they're a fan of whatever. Maybe it was baseball and they wanted to catch a pro game, or visit museums based on their interests, etc. Sometimes these things are very difficult to schedule due to the game day and hour, or the hours that a certain place is open. I faced this today. 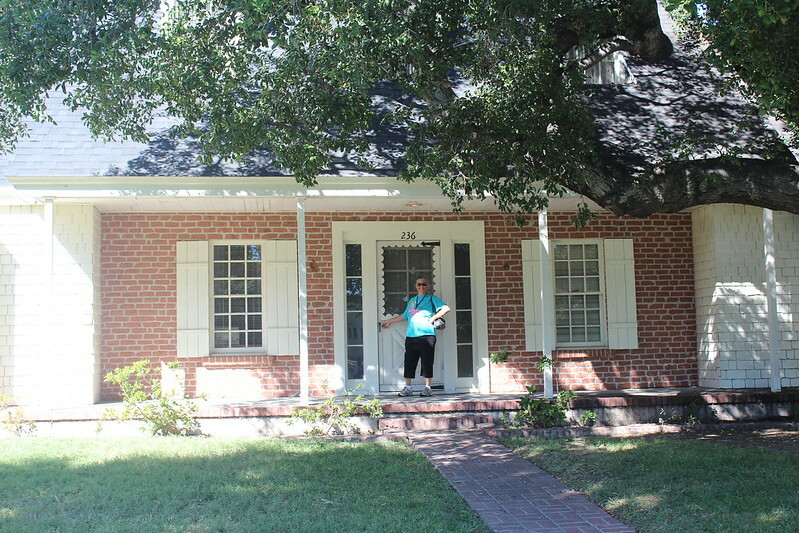 My first stop was to visit the Warner Bros Studio Ranch, which was formerly the Columbia Ranch. This is NOT part of the Warner Bros. "Three-Hour Tour", much to my disappointment when we took that tour 7 years ago. It is only open for private tours. The reason I am mentioning this part of my day, is just in case someone is going to schedule themselves for a tour at Warner Bros Studio in Burbank, and thinks they get to go to the Ranch. I managed to be part of a private tour this morning, as I am part of a group of I Dream of Jeannie fans online who arranged it as part of the 50th Anniversary of the show. I will include one picture, of me outside of the IDOJ house. 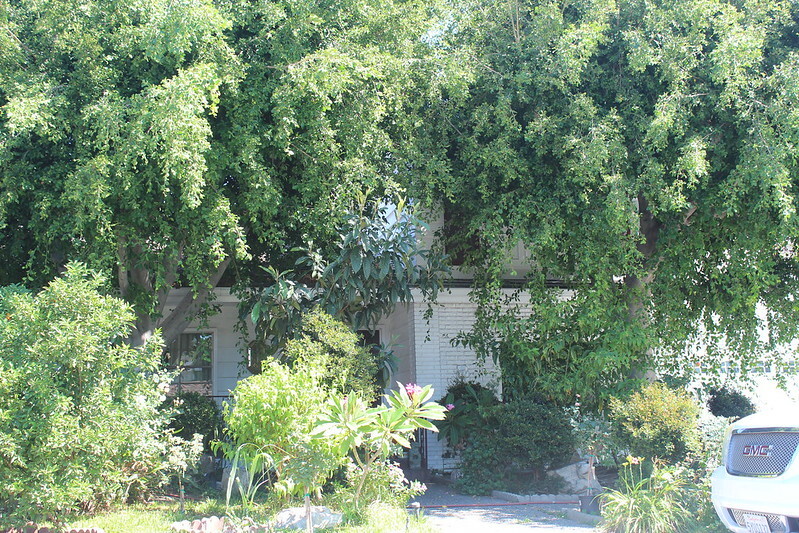 If it looks familiar, this house was also the Blondie house in the old movies, Dennis the Menace TV show, and more. 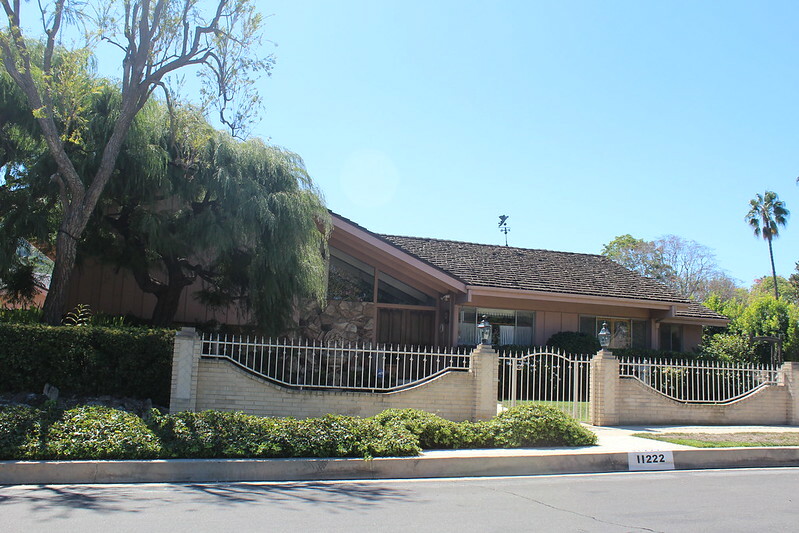 Yes, that's the Brady Bunch home. When I was online, I found the address. Thanks to my GPS, I was able to drive right to it. This home is a private residence, and I had already made up my mind: if someone was outside the house, or any of the neighbors' homes, I would not aim my camera out the window for a picture. However, the temperature was over 100, so most people were smart and stayed inside their homes! The next stop was another of those places that's hard to visit. 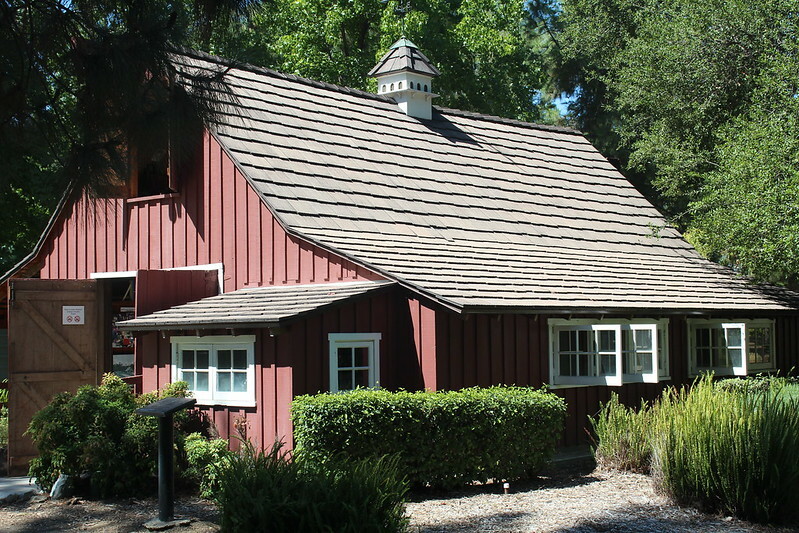 "Walt's Barn", or the Walt Disney barn and property on Zoo Drive at Griffith Park, is only open once per month -- the third Sunday of the month -- and only from 11 am to 3 pm. It's been a place on my bucket list since visiting the Walt Disney property in Marceline, MO. It's also harder to find. As I drove along Zoo Drive, the first stop was Travel Town (nope, but that's a lot of full size trains all in the same place to look at, close up). 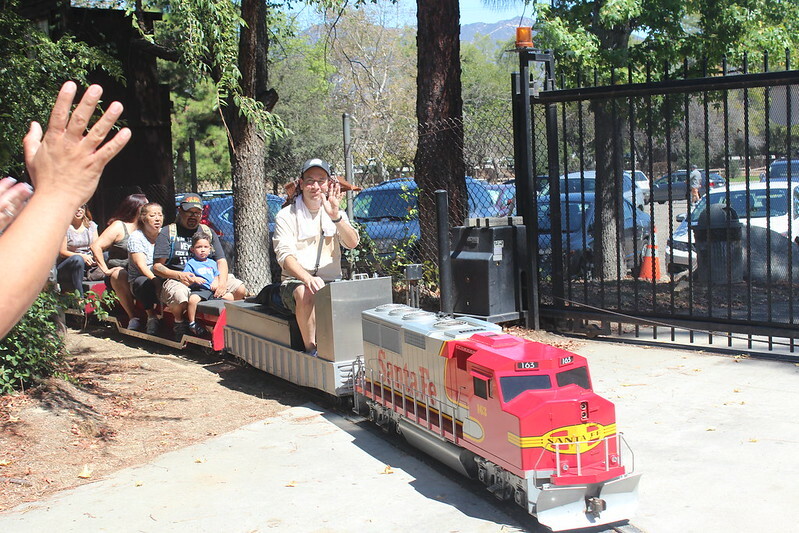 The second was the miniature railroad Live Station (nice if you have kids who would love a train ride on a small train). The third was Walt's Barn area. One of the first things I saw there, after discussing the place with the folks at the gate (no admission charge, btw), was the train. Evidently the miniature train next door can ride through the property when the Barn is open. 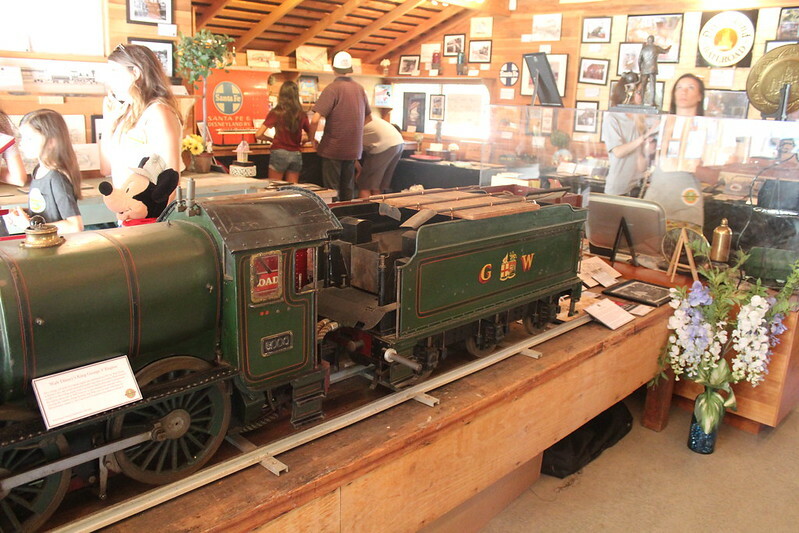 The barn is a museum, currently showing a 60 year history of the different trains at Disneyland. 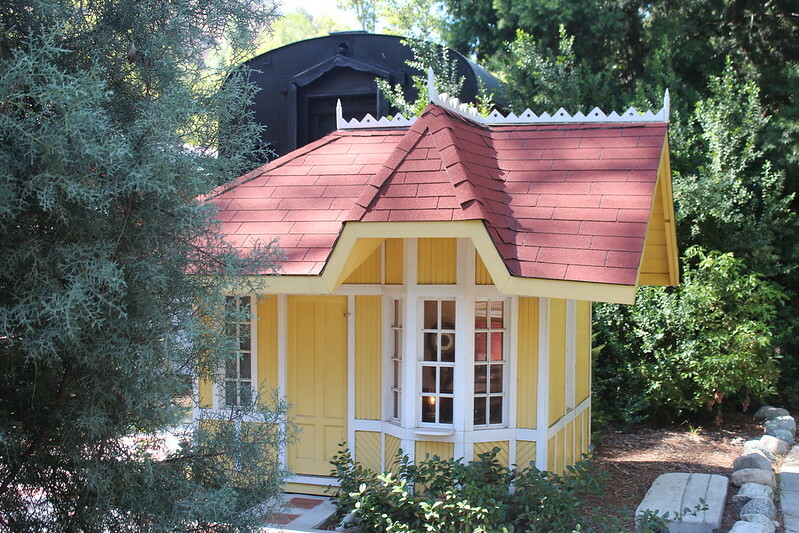 At one point, Walt Disney had a railroad going around his home, which he called Carolwood. The train was called the Carolwood Pacific. One of his major animators, Ollie Johnston, also had a small train on his property. Here's the depot he built for it. It was very, very hot today -- over 100 -- and nothing at Walt's Barn was air-conditioned. Also, my husband was not with me. So I vowed to come back in a few months when it is a cooler, and bring him along. On the way home, I made two more stops, both down in Downey. One of my favorite music groups of all time was The Carpenters. I cried back in 1983, when Karen died. However, their music lives on. I decided to find two houses that they lived in, back before Karen died. 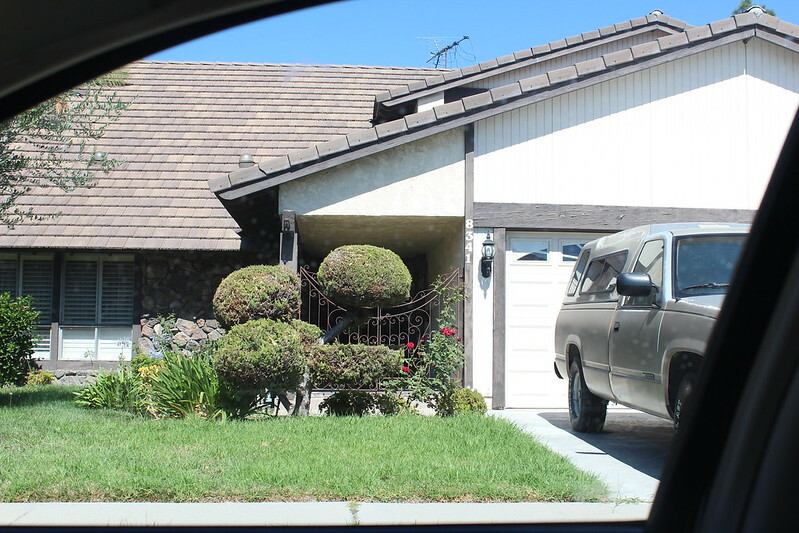 One was the house where Karen lived when she was found unconscious, the day she died. On the way to the house that was featured on the cover of one of their albums, I spotted this. Sitting at a traffic light, I quickly grabbed the camera and took this photo. 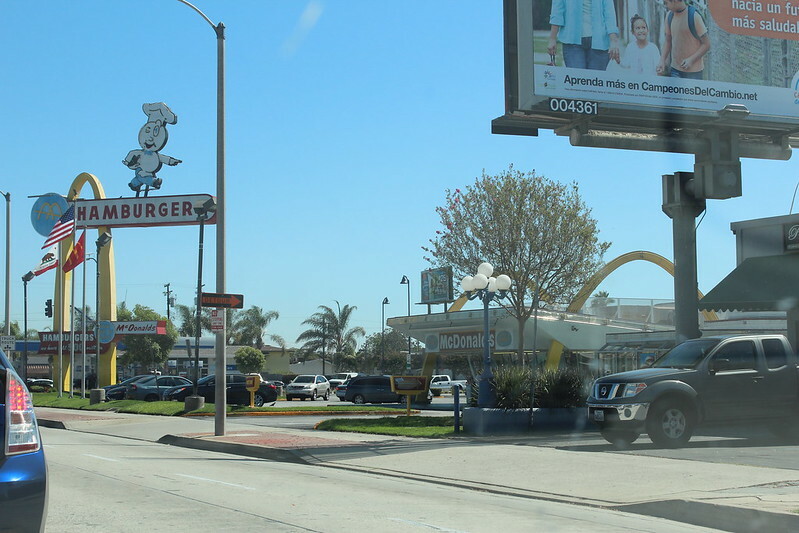 Then I found out that this is the oldest McDonald's in the country. The second home was rather disappointing. I was guessing that the current owners are tired of folks coming up and taking pictures of it, so they let the trees grow out so that you can no longer really see it. So ended my day -- about 9 hours after I started it, and 250 more miles on my vehicle. 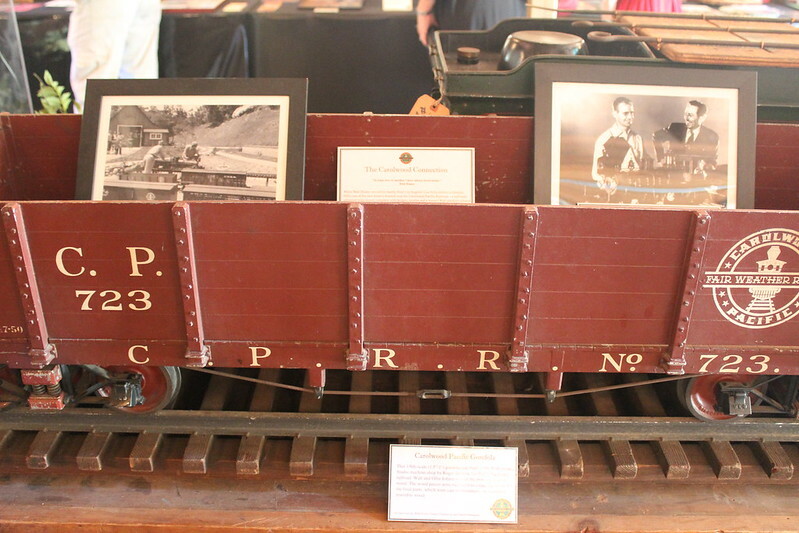 One of the things I wanted to see at Walt's Barn, was Walt's Carolwood Pacific Railroad. This was the train that went all around his property in California (before DL), a miniature railroad. 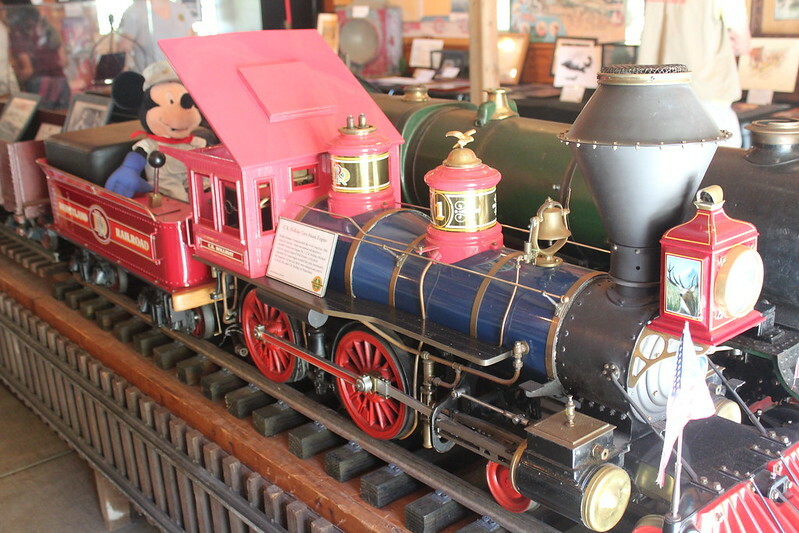 A lot of history of the railroads in Disneyland were included in that museum. This included the Mine Train through Nature Wonderland, various monorails, the Casey Jr Railroad, and so much more. 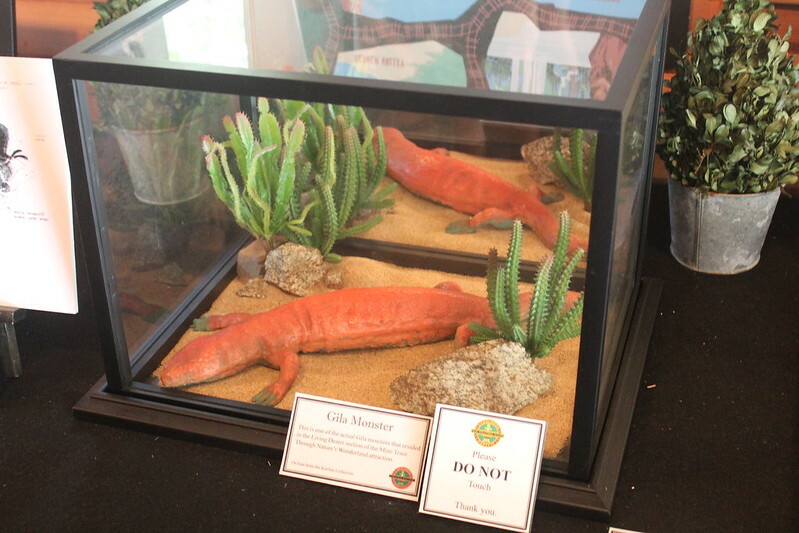 Here are some things that used to sit along side of the Nature Wonderland train, back in the late 50s and early 60s. So....we're stuck at home again. While my arm has healed fairly well, and my eye is almost perfect again, this time it's my husband's turn. About 5 weeks ago, he stubbed his baby toe but good and broke it. They can't do much for it except wrap it for a week, then let it heal normally. They told him he could go hiking when he felt like it. Right after doing our first hike of the season, HE tore the retina on his right eye, and had to undergo laser surgery for it. No more hiking for awhile. We were the talk of the ophthalmology department, as there are only 2 retina specialists and neither of them have treated a couple for the same thing within 3 months of each other! So this leaves me with time to fill, making videos of our past trips and Stay-cations. Stay-cation 2015, Part 1, can be found here. Stay-cation 2015, Part 2, can be found here. Stay-cation 2015, Part 3, can be found here. The rest will be forthcoming. And the rest of the summer. This one includes Knotts and Safari Park. No, I didn't take any actual videos on the rides at Knotts. If you recall, I rode a whole two rides (some video game type ride and the Sky Tower thing) and watched a couple of shows. And walked a whole lot! Next summer, we hope to do a trip. Right now, we're talking about Missouri (of course) to visit our daughter and the grandkids, then coming back via Montana. No east coast this trip! And for those that are curious, yes, these videos include some of our family, including me. Leaf Peeping Season has already begun!